The recent remodel of the 1930s kitchen and bath included closing off a couple of doors, one was in the kitchen. The second door to be closed off was in the dining room and lead to the front bedroom. We felt this door was misplaced from the beginning, probably someone mis-read the plans and put the door on the south end of the wall when it should have been at the north end. This placement meant the front bedroom had two doors that were in constant conflict; one went to the hallway and the other to the dining room. Additionally, the front bedroom had a door or two, or a window on every single one of its four walls. Not great for furniture placement. 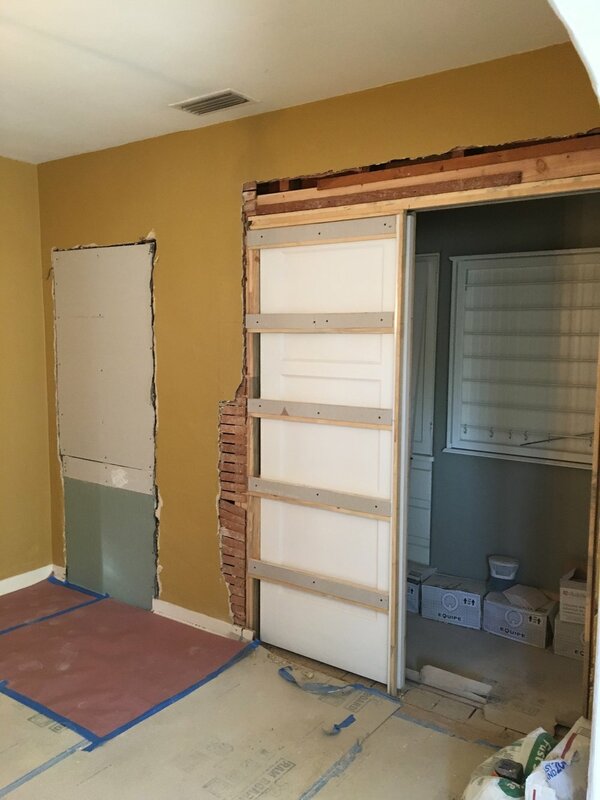 We had talked for years about removing this door and opening the wall at the north end of the same wall which leads to the hallway, bathroom and two bedrooms. With the removal of the door in the kitchen this would be the only way to the hallway from any room, making all the rooms more useful, since each room would have more wall space for counters or furniture. While we were under construction, it seemed prudent to take care of this issue at the same time. Smartest. Move. Ever. Pocket doors have been around almost from the beginning when we graduated from one room to many rooms, and wanting privacy. It makes so much sense, takes up no space and offers privacy without the inconvenience of having to allow for a door to swing into a room. I remember the huge oak pocket door that separated our living and dining rooms in our first home, a 1917 Craftsman Bungalow, now that was a heavy door! We did consider using the now very popular barn door installation, but there are considerations to make with this type of door. It would most likely considered a piece of furniture or artwork, since it would be “on the wall” when opened, and always on display, as opposed to be inside the wall, and out of sight. In this case it could have been partially hidden behind the china cabinet when opened, but it just felt too heavy and cumbersome in such a small space; while a pocket door would simply disappear. The homeowners leave the pocket door inside the wall most of the time, closing it only if they wish to close off the rest of the house: two bedrooms and two bathrooms. This wall actually bisects the house, which is nice if you want privacy from the non-public rooms, opening it only for access to the hall bathroom. My handy husband and father/father-in-law of the homeowners, took the door from the front bedroom and filled in the hole where the door knob had been and made it a wee-bit wider to fit the new pocket door opening; which comes as a standard size in a kit. He filled in the holes, sanded, primed and painted it until it looked like new. Using one of the original doors kept the house authentic. Now the house functions like it should have more than eighty years ago. It was a smart move and both the dining room and front bedroom are more functional. Another win/win for the little house, now to get some flooring to finish where the wall had been.